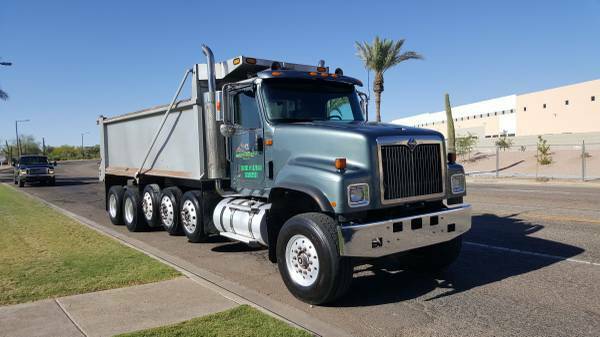 2006 INTERNATIONAL 5500i Super/Simple 16 dump truck, 440,000 miles on CAT C15 475 - 650 HP Twin turbo, Fuller HD 8 speed, Chalmers suspension, Watson & Chalin steerable lift axles, 20.5’ Bibeau AR steel bed, 11R22.5 tires on aluminum rims atleast 90%, Rockwell Front Axle 20,000#, Meritor Rear Axles 46,000# with full lock up, heavy duty frame, heated mirrors. New radiator, windshield, a/c, tarp motor, hoist, recent complete overhead tuneup done at Kenworth, does not use or leak oil. Swing/barn gate and extra high sides for trash/demo. This truck was factory built heavy spec to hold up under heavy duty work on and off road. Purchased in Ohio in 2007 w/15k miles, fanatic about maintenance. Firm on price due to condition of truck. Cash only, cannot finance/carry papers.